I hate to take away from the speculation about whether or not Sarah Palin will run for president when Obama's time is up. But I hereby declare my own candidacy in this year's Celebrity Cheese Building Competition! Remember last time I competed? Above is a photo my friend Judi Griggs took of me competing, bitterly, in last year's contest. Now I have been invited back! 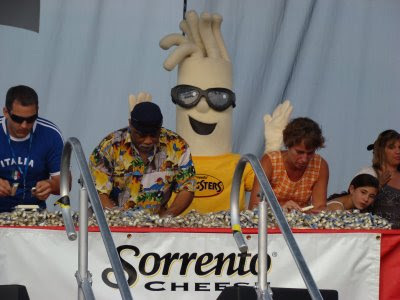 And this year they are initiating a Mary Kunz Goldman Law, something about each contestant will have his or own separate judge to measure the cheese tower before the wind or other circumstances has a chance to knock it down. I guess something like that happened last year, compelling me to -- perish the thought! -- lose. But I honestly do not remember much. I was in too big a hurry to get to the wine tent. It is like when Leonard Pennario was 12 and learned the Grieg concerto in a week so he could play it for 2,000 people at the Texas Exposition, all he remembered of the performance was that when it was over he could go on the rides. I am the Leonard Pennario of cheese building! Those of you who are in Buffalo, come to cheer me on on July 16. Come on, you want to go to the, ahem, Sorrento Cheese Italian Heritage Festival anyway. July 16 is as good a day to go as any. And note to out-of-towners: Send those prayers and good vibes in my direction! If I win I get $500 for St. Anthony of Padua. All year, he will help us all find our lost objects! Now, I feel that I have heard of everything, lol. Wish Buffalo was a bit closer. But I have an out-of -towner's idea to go with the new rule. Why not incorporate the cheese building into a wine tasting thingy? Have like extra points for lofty tasting along the way... I once heard that wine and cheese go well together. All I really know about wine is that when it is distilled via the pressure cooker, it is not too good to the taste but will blind one fairly quickly.